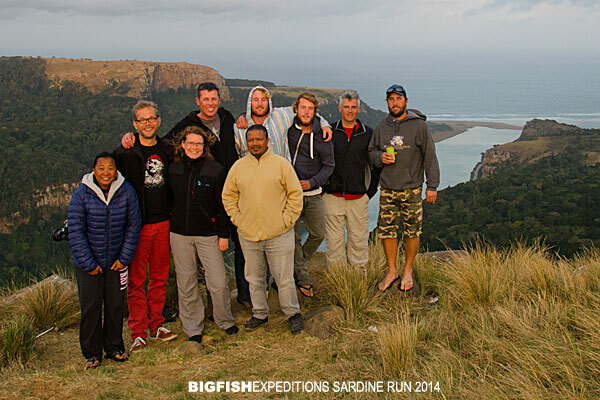 Over the course of nine days, this year’s Sardine Run slowly built towards a spectacular climax. We started the expedition in East London; an area with an excellent track record for bait ball activity. Unfortunately we ran up against bad visibility so when we found our first baitball the filming opportunities were limited. 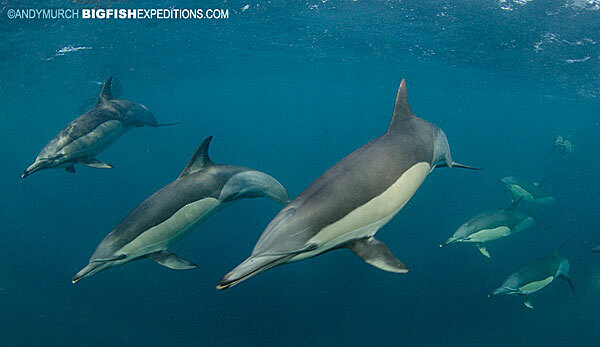 However, we did see brydes whales and plenty of humpbacks as well as large pods of dolphins working the bait fish. While we were there, I had an opportunity to drop the Deep Cam a few times which resulted in this footage of a pair of Shortnose Dogfish. Tragically, on our final day in East London the we returned to retrieve the Deep Cam but it was nowhere to be seen. We will never know if a large shark cut the line or if a local fisherman took a shine to it but whatever happened it is not coming back. I’ll start designing a new one as soon as I’m back in Canada. After a few days we switched to Port Saint Johns; a small town located on a dramatic stretch of South African coastline known as the Wild Coast. As soon as we arrived we found a great deal of bird activity. 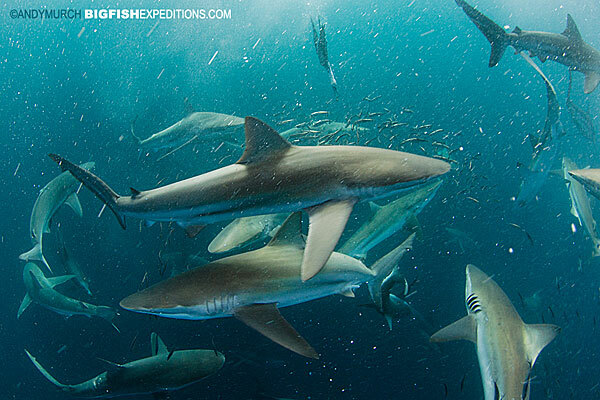 The visibility was still a challenge each day the water turned bluer and while we waited for bait balls we dove on the reefs and chummed up offshore sharks. Few divers venture onto the Wild Coast’s inshore reefs. Surge undoubtedly plays a part but a history of white shark attacks on swimmers and surfers is probably also a contributing factor! 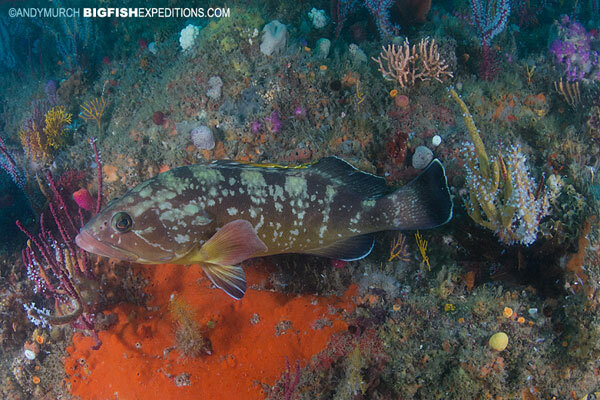 The reefs we dove were heavy with crayfish and respectably sized groupers that were drawn to our bait crate. Our offshore chumming sessions were a lot more sharky. 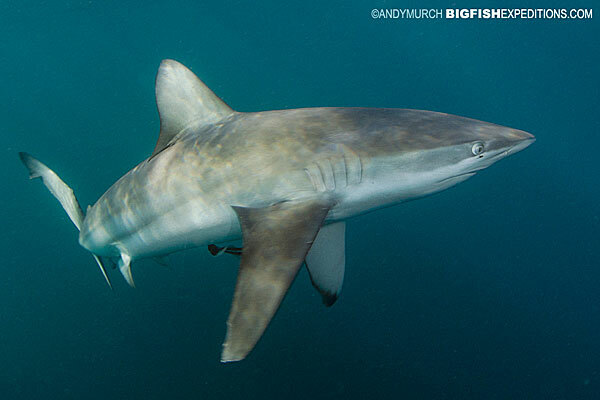 We managed to attract enough bronze whaler sharks to keep us entertained while we waited for the gannets to show us the way to the bait balls. Veteran Sardine Run addicts understand the need for time on the water. There are so many factors that come into play. The predators and gannets are always there waiting for a meal but the sardines and other baitfish have to appear on schedule. The winds also have to abate enough for the birds to see the baitballs underwater and the surf has to be small enough for the boats to be able to make it over the sand bar at the mouth of the Umzimbuvu River. 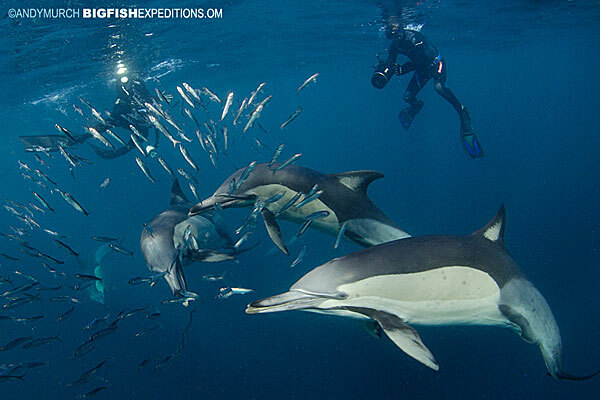 Then, it comes down to water clarity because swimming into a ball of sharks and dolphins that are dive bombing a moving ball of sardines is not something you want to do in low visibility! After multiple jumps on different bait balls we were still waiting for the perfect ball. Then, on day 8 of 9, it all came together. At first light we skimmed over the bar and headed into windy seas. It was cold and the weather did not look great but the winds dropped steadily during the morning. 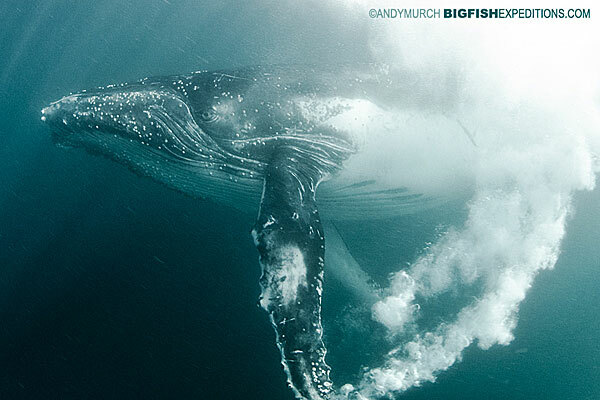 Suddenly, our eagle eyed crew saw the unmistakable signs of major bird activity on the horizon and gunned the engines while we raced to don fins and weight belts. When we approached, the sky was filled with gannets raining down on one boiling patch of ocean. We tumbled in immediately. 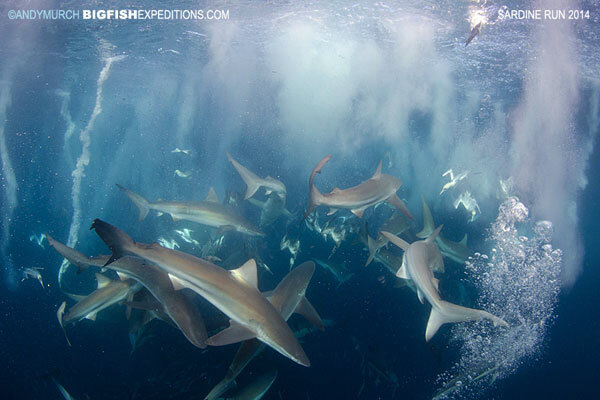 Looking down through clear blue water, all I could see were sharks! 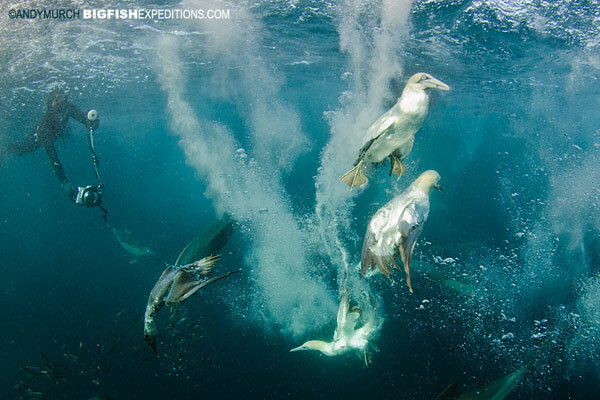 A pack of bronze whalers smashed through the bait ball while gannets continued to drop out of the sky all around them. It was a sight to behold. After a few minutes the sharks were replaced by about a dozen lightening fast common dolphins that bored holes through the ranks of the hapless bait fish, picking off one sardine after another and leaving thousands of glittering scales drifting into the inky depths. Menacing sharks and ballistic dolphins aside, in my opinion the most visually spectacular component of the show was the diving birds. As we floated next to the ball trying to compose images, gannets plunged into the water around us like bullets. When they punched through the surface it sounded like a series of tiny explosions, followed by a hissing effervescent trail of bubbles as inertia carried them meters under the water. 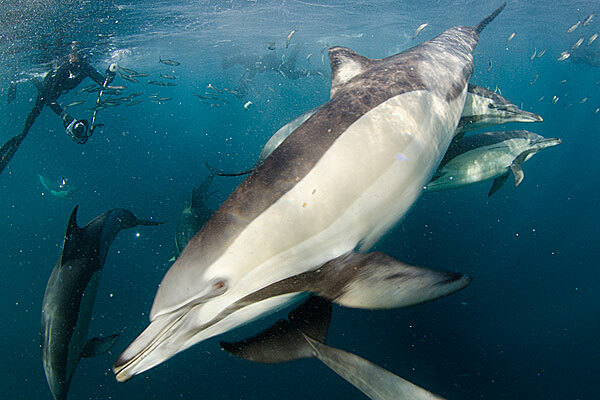 Deftly dodging dolphins, sharks and divers alike, the gannets somehow still had the wherewithal to pluck a sardine from the writhing mass of fish and then scull their way back to the surface before swallowing their quarry. After 40 minutes of world class action, we watched the last sardines meet their demise in the jaws of the engorged dolphins until all that remained was the dolphins themselves and a few glinting scales falling out of sight. It was without doubt, one of the most incredible natural events that I have ever witnessed. That night we poured through countless beautiful images and celebrated our good fortune. We cut our final day on the water a little short and drove onto the bluffs above PSJ to enjoy the majestic vistas that this area is famous for.